For the first time in roughly 10 seasons, two veteran players named Gonzalez are riding the buses in the Minor Leagues. Well, that's not completely accurate. Former Rockies outfielder Carlos Gonzalez, who began this season with Columbus before the Indians called him up on Sunday, appeared in the Minors on rehab stints several times after sticking in the Majors in 2010, the most recent visit coming in 2014. And left-handed pitcher Gio Gonzalez, who started the season with Scranton/Wilkes-Barre, also had a pair of Minor League rehab appearances that same year in a career that included time with the A's, Nationals and Brewers. What's more, saying Carlos Gonzalez rode the bus in Columbus is not correct, since the Clippers played at home until flying to Durham for their first road series of the season. Still, seeing the two 33-year-olds in the International League this year was unusual, to say the least. Both have enjoyed success in the big leagues: Carlos Gonzalez is a three-time All-Star who also won three Gold Gloves with the Rockies, while Gio Gonzalez appeared in a pair of All-Star Games and finished third in voting for the 2012 National League Cy Young Award. Carlos Gonzalez signed with the Indians in mid-March and his focus was on using his time with the Clippers as a sort of Spring Training. "I was really excited when I first got the call that the Cleveland Indians were really interested in me," he told The [Columbus] Dispatch. "It's a great challenge for me. This is an organization that not too long ago was playing in the World Series, and as a veteran player that's the thing you want the most. You want to win a championship." Gio Gonzalez signed a Minor League contract with the Yankees and hopes to prove he deserves a return to the Majors. "The way the market came off this offseason is just unfortunate," he told The [Wilkes-Barre] Times Leader. "I still feel like I can compete at a high level. I thought that I could easily get a job. I'm very fortunate the Yankees gave me a chance to show I can still pitch." 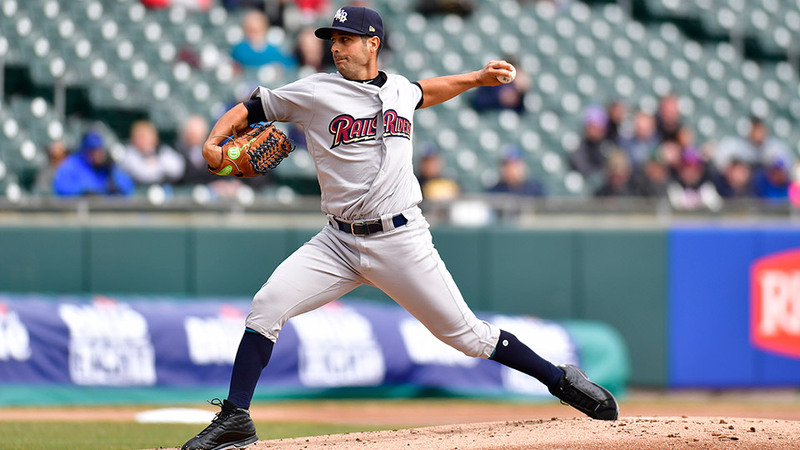 Gio Gonzalez said he also wants to spend his time with the RailRiders helping his teammates also reach New York. "I want to give them a lot of information. I want to be a book for them," he said. "I want to let them to approach me. I don't want to think, 'Let me pitch great so I can leave.' I don't want to put that pressure on myself. I just want to pitch." Clippers manager Tony Mansolino said having Carlos Gonzalez on his team was a learning opportunity for the team's younger players. "That's a star," Mansolino said of the player known as "CarGo." "That's a superstar. He's done everything that everybody else has done. You'd have no idea that this guy has had the career that he's had just by seeing how he interacts here. You don't expect that from superstars, but he's been everything you'd want a guy like that to be." Gio Gonzalez should not have to wait long to learn if he will return to the Majors: the lefty has an "out" clause in his contract which allows him to become a free agent if he is not promoted by April 20. "This is a way to show that I can still do my job at any level," Gio Gonzalez said. "Hopefully, I make a point and prove I can still pitch in the big leagues." Cronenworth "cools off": Durham shortstop Jake Cronenworth had "just" one hit in each of his last four games, and after his hot start this season, that constitutes a slump. He went 13-for-18 (.786) to start the season, including back-to-back four-hit games on April 5-6 at Charlotte. Currently, Cronenworth is batting "only" .515 with 10 runs scored and five RBIs in eight games. Mowing them down: Lehigh Valley RHP Enyel De Los Santos leads the International League with 19 strikeouts through two starts, both wins. The Phillies' No. 6 prospect fanned 10 over five innings to beat Rochester on April 6, then had nine whiffs in seven innings in a win over the Red Wings on April 12. The 23-year-old yielded six hits and one earned run over his first 12 innings. He said it: "Spring Training this year was the most fun I've had playing the game, just because I had two years off, really. I feel like a young kid again, like I'm new to the game. I'm just happy to be out there." -- Syracuse LHP Ryan O'Rourke to the Syracuse Post-Standard. He pitched for the Twins in 2015-16 before undergoing Tommy John surgery and missing the following year, then made 15 appearances last season. In his first three appearances with the Mets, O'Rourke gave up five runs -- four earned -- on six hits and three walks while fanning four in six innings.